All guest rooms are equipped with individually controlled air conditioning, colour TV, radio alarm clock, IDD telephone business desk, refrigerator, coffee and tea making facilities. All bathrooms have combined bath and shower with hair dryers. All windows open, some rooms have balcony and we also provide self-contained studio apartments. A delicious full buffet breakfast is available in our fifth floor breakfast room with friendly and courteous service. Hotel Facilities include 24 hour reception, same day dry cleaning services, guest laundry, tour desk and safety deposit boxes. Jogging Tracks, Marina, Tennis and Health Clubs are nearby. Other facilities include a Chinese Seafood Restaurant and an Indian. From the warm welcoming smile at the reception desk to the comfort of your room, you are aware of the cleanliness and good value that is part of the DeVere's charm. 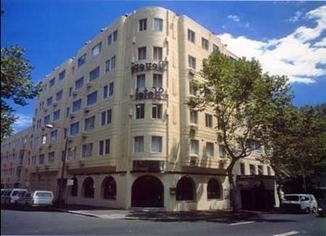 So, when choosing accommodation in Sydney, choose a hotel like the Devere Hotel which offers great value and all the convenience travellers are looking for. We will not check in guests without a photo ID and credit card together. Only passport and drivers license will be accepted. **Room Only for 2 persons** Room has 1 double bed, En-Suite bathroom with bath, Reverse cycle air-conditioning, Colour Television, STD and ISD Direct Dialling, Clock radio with alarm, Tea/Coffee making facilities & fridge. Rate is for 2 guests. **Room Only for 2 persons** Room has 2 single beds, En-Suite bathroom with bath, Reverse cycle air-conditioning, Colour Television, STD and ISD Direct Dialling, Clock radio with alarm, Tea/Coffee making facilities & fridge. Rate is for 2 guests. Fax, photocopying machine available on-site. Check in time is 2pm. Credit card imprint and photo ID is required. $20 deposit if not paying by credit card. De Vere Hotel has a 24 hour reception. Children 12 years and below are free, however, if 2 children staying with 2 adults, 2nd child pays 3rd person rate. 3rd person rate is $65 per night subject to change. Maximum of 2 adults and 2 children in room or maximum 3 adults in room. * Off-site car parking is available to DeVere Hotel guests at King's Cross Car Park on Ward Avenue. * The Kings Cross Car Park - located behind the El Alamein fountain park - is a few minute walk (about 200 metres away) from the DeVere Hotel. * Discounted car parking voucher(s) - at $ 25.00 per 24 hours of parking - can be purchased by DeVere Hotel guests at our 24 hour Hotel Reception. Also, $25 per exit. Rates are subject to change without prior notice. * This discounted car parking voucher also entitles guests unlimited vehicle entries and exits to the 24 hour Kings Cross Car Park. * These rates are subject to availability and change. From airport take southern Cross Drive, south Dowling Road, left to Oxford Street, immediately right to Darlinghurst Road to Kings Cross, becomes Macleay Street from the fountain, drive pass Grenknowe Avenue, after one block is the hotel corner Crick Street and Maclay Street. Visit Elizabeth Bay House, Elizabeth Bay Marina, NSW Gallery, Botanic Garden, outdoor swimming pool at andrew Boy pool, Australian Museum, Cook and Phillip Park with indoor swimming pool and tennis courts and basketball courts, Kings Cross night life, jogging tract to Sydney Opera House.